Is this true? Can we change anything? Our thoughts and our feelings seem to be the hardest things to control. This may not be true for everyone, but for me it is true. When you move to another country, one has a lot of time on their hands to think, ponder, read, feel, think again...you get the picture. I have decided that I really need to control what I put in my mind - you know, crap in, crap out. So, I started reading. 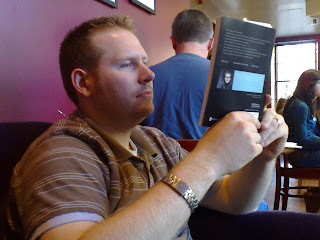 I am in the middle of reading Velvet Elvis, by Rob Bell. This book is phenomenal. A definite must read. This book has opened my eyes to so many aspects of the bible that I never even knew, or thought of. Rob does a good job at letting people know that it is okay to have questions about God, it is okay to not have it all figured out. How great is that?!? Every day can be a learning experience! I read Ian some of the things that have really stuck out to me in the book, and he started reading it today! Look at the impact I have on that man! I want to take control of my life. I won't let myself be blown around in the wind. Everyday, I want my life to count and matter. This means, I have to focus on the things that count and matter. I know you all thought I was just over here in Scotland partying it up, but look at what has been going on...I have been thinking, and reading! WOW....you have done some serious thinking! It really is all about us. lol. Bravo! Very well written and very true! Thanks for the inspiring blog...you ROCK!!! Awe yeh. I knew that would be a great farewell gift! ;) What you have realized, articulated and are working to apply are truths that we all should be striving to grasp and practice. I love that this change in location and in pace of life has helped facilitate this "thinking thing". MY brain is mush these days...ha! Keep the thoughts coming!